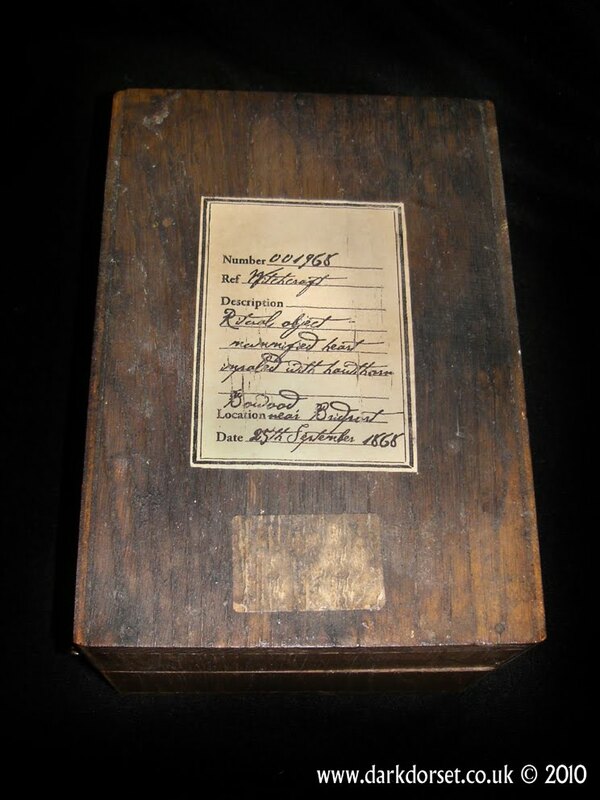 Duncan Eagleson brings us this preserved example of the Northern Creek Sprite. 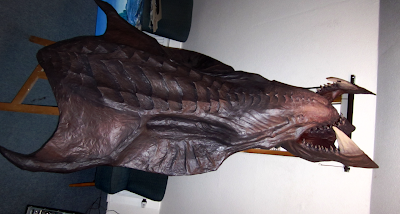 Given the small size of the figure the level of detail, particularly the flowing lines of the fins, is impressive. I think it would benefit from distressing, but that's purely a personal judgement. One never knows what will show up in on your hook when you're fishing off Innsmouth. 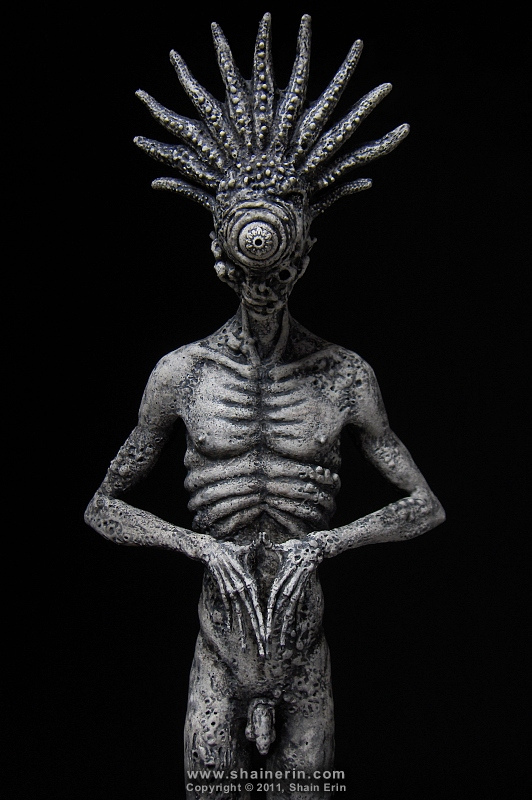 Anders Eriksen brings us this silicone cast from his original sculpt. I'm not sure about the teeth, but I really like how color is used to bring the bust to life. The red wash over the milky white of the flesh gives an approximation of flesh tones while the eyes are nicely set off by the dark rings. 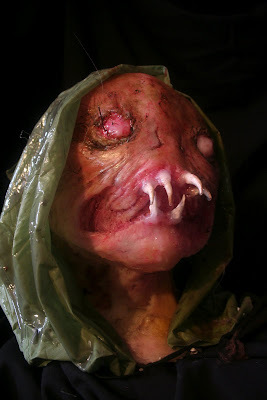 Carl Johnson brings us this nicely done spawnling. I really like the subtle anatomy of the figure. Tom Banwell is an incredibly talented artist who has created some of the best retro-futurist artwork and artifacts I've ever seen. Beyond that, he's consistently provided in-depth looks at the creation of his work that are filled with advice and detailed descriptions of his techniques. That willingness to share is one of the reasons I have such an immense amount of respect for the man. Sadly, he's also been ripped off by the Norwegian oil company Det Norske. You can read about the sad hijacking of his art, along with the work of other artists, over here at the Art Theft blog. No, you haven't ended up at the wrong site. While there's a case to be made that John Belushi's character in "The Blues Brothers" is a chosen favorite of Nyarlathotep, the film isn't something that falls within the normal purview of Propnomicon. Except in this case, it does. Two years ago I stumbled across an interesting "Italian wooden space helmet prop" being offered by the Blackman Cruz design and decorating firm. 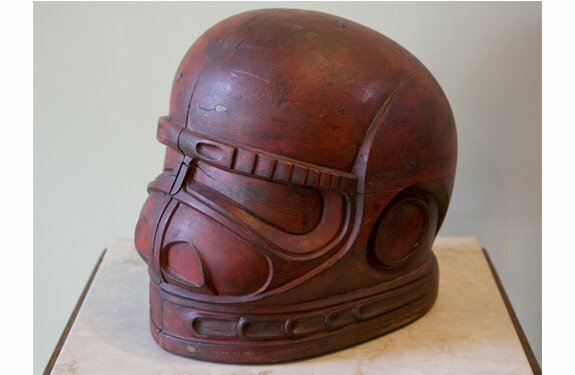 It allegedly dated back to the 1930s, but bore a striking resemblance to some of Ralph McQuarrie's concept designs for the stormtrooper helmets in "Star Wars". Given the rabid community of fans that microscopically study every detail of those helmets I thought it was amazing that no one had ever remarked on the similarity. Last night "TK826" left a comment on the original post about the helmet that points to this still from the making of "The Blues Brothers". It's filled with vacuum formed casts from the "1930s Italian space helmet prop" master, presumably from a toy store in the mall rampage sequence from the film. The picture doesn't prove the Blackman Cruz helmet isn't from the 1930s, but I think it's pretty strong evidence in that direction. 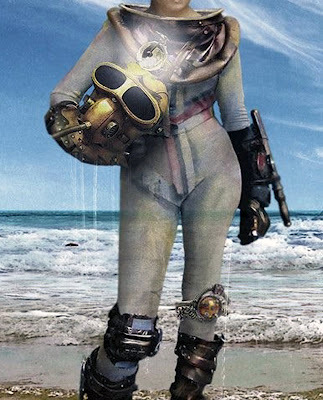 To date no one has ever identified an Italian film from any era featuring that particular helmet design. It seems far more believable that the master was produced in the late 1970s by the prop house providing set decoration for "The Blues Brothers" and was intentionally patterned after the McQuarrie designs. An intriguing alternative is that it's an actual master from the pre-production period of "Star Wars". If that's true there's someone out there who thinks they have a pricy objet d'art sitting on their tabletop, when in actuality it's a prop master a "Star Wars" collector would die for. 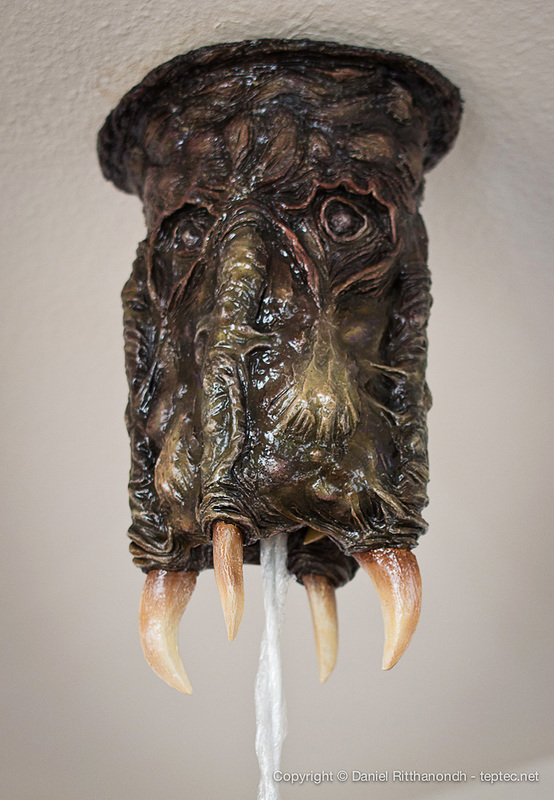 The talented Daniel Ritthanondh brings us this disturbing light fixture. Things are moving along with the Mountains of Madness project. 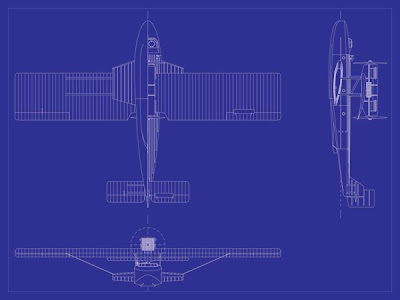 Here's a work in progress shot of the blueprint for the expedition's Dornier Wal aircraft. A lot of the work that went into getting it to this point is totally invisible. I've been trying to make logical tweaks to the baseline design to bring it more in line with the level of performance in "At the Mountains of Madness". That means taking into account the increased power from an uprated engine, the weight savings gained by swapping structural steel for aluminum, and the increased lift generated by an enhanced wing profile. Much of the inspiration for those changes has come from the improved military Wals produced under license for the U.S.S.R and the two modified reconnaissance planes used by the German Antarctic Expedition of 1938-1939. Update: Elmo Iscariot sent over a snapshot of the plane in Ian N. J. Culbard's graphic novel adaptation of "At the Mountains of Madness". 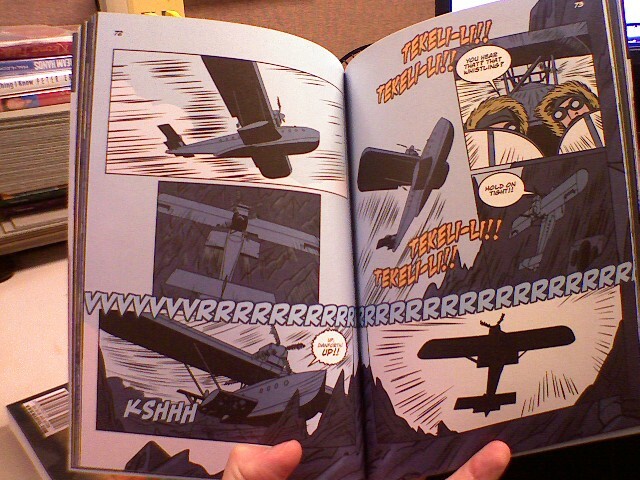 It's a pretty faithful depiction, and I absolutely love the page layout. 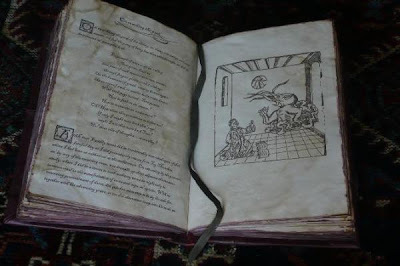 The Biblionihilistica brings us this copy of the Mythoplasm Ex Somnus. 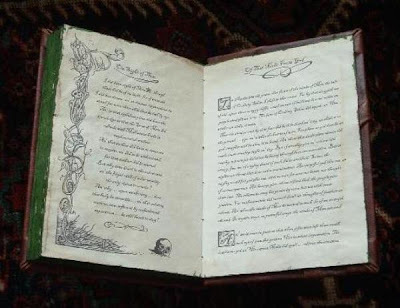 The tome features all custom artwork and a very nice handmade leather binding. There are few things with a higher squick factor than maggots. They generate a visceral sense of revulsion, despite being harmless, if not outright helpful, to human beings. Mark Angenola of MVAEFX brings us this handy tutorial for cranking them out by the dozen. 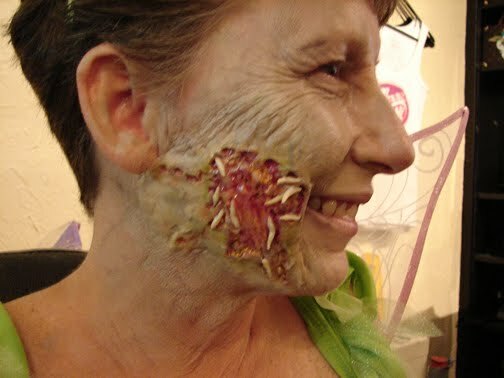 The recipe takes advantage of the reaction between latex and vinegar to quickly set up the skin and speed production. 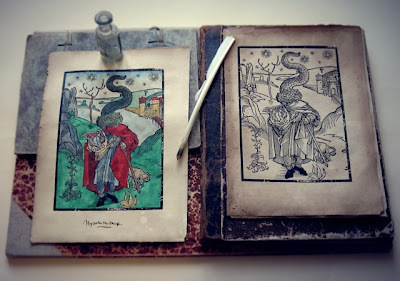 Laurent Gontier is attacking the monumental task of crafting a recreation of the Necronomicon from scratch. 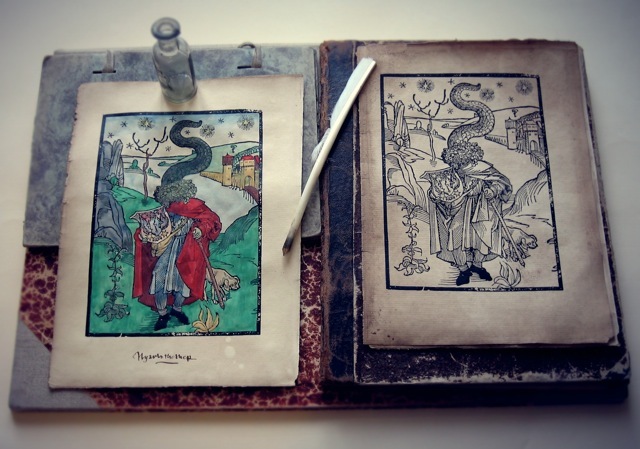 This is one of the faux woodcuts he's created for it, depicting Nyarlathotep in the style of Albrecht Durer. Based on his previous work, which you can check out here and here, I'm really looking forward to how this develops. Brian Demski brings us this preserved facial fragment. The paint job is just outstanding. No, not the necessary acceptance that you're getting older and will eventually die, but the thought process behind aging and distressing a prop. 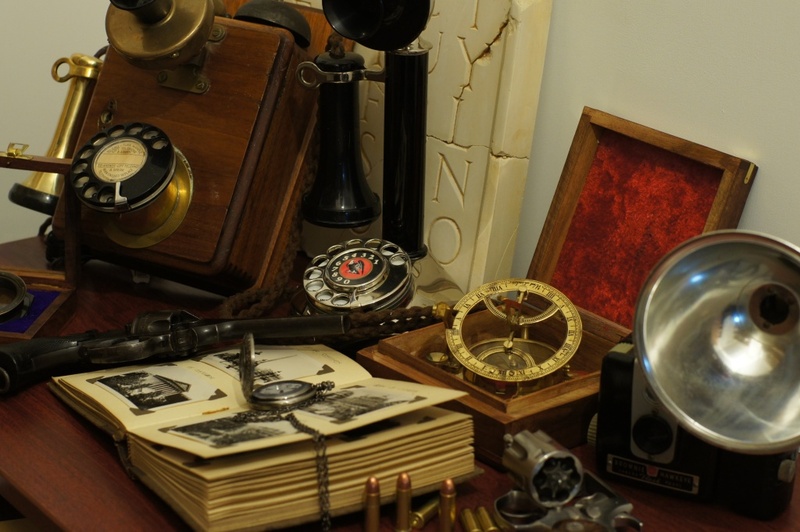 Professional designer George Ledo brings us this insightful discussion about antiquing props. He's speaking to an audience of stage magicians, but his thoughts on developing an aging treatment hand in hand with the item's backstory are equally applicable to Lovecraftian artifacts. Antiquing isn’t a formula; it’s a concept. That’s a phrase I learned a few years ago when Donna and I attended a class on how to make paella, which is a Spanish seafood dish. One of the first things the instructor said was that there’s no “classical authentic recipe” for paella. Paella is not a recipe: it’s a concept--a traditional way to use rice, and chicken, and chorizo, and locally available seafood, to make a one-course meal for several people. An effective technique is to think of the object as having a history, and of each part of its history as being a “layer” that can be addressed separately. 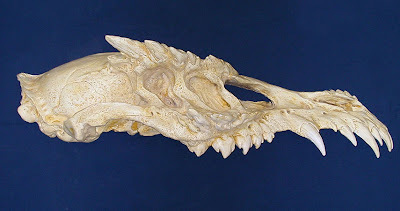 Although it’s impossible to create a “how to” list about antiquing props, I’m going to show a couple of hypothetical examples of how I would go about doing this, using standard theatrical techniques. 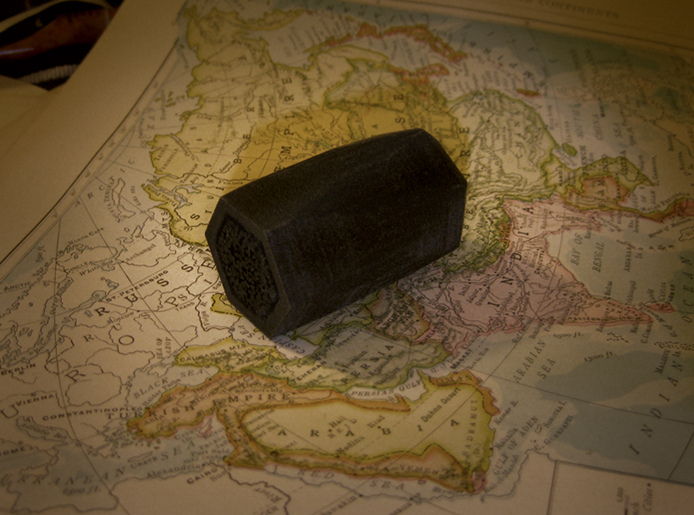 This will of course delve into the actual design of the prop, but I’ll focus on the antiquing. 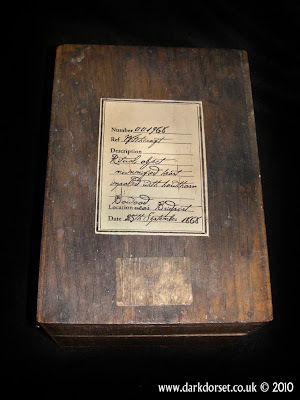 - Arthur Machen, "The Novel of the Black Seal"
Mike Jenkins brings us this reproduction of the infamous Black Seal that lead to such tragic misfortune for Professor Gregg. Some secrets are not meant for the eyes of modern science. Terpandre brings us this recreation of the Shining Trapezohedron from Lovecraft's "The Haunter in the Dark". The glow is produced by black light reacting with zinc sulfide mixed into the raw resin. I really like the crackled effect. I don't think I've ever featured a mainstream news story, but when Andrew James sent over a link to this one I knew I would be making an exception. Sideshow-style gaffs have a history going back hundreds, if not thousands of years. 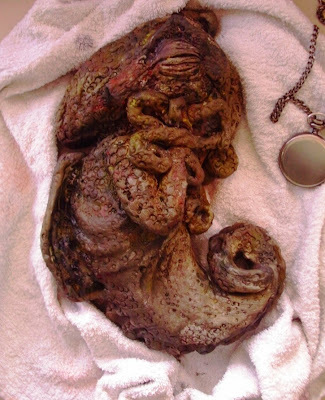 Now scientists are taking a close look at the Buxton Mermaid, a specimen that's been around for close to two centuries. 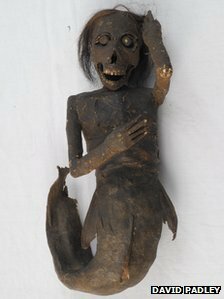 University staff and students are doing tests to uncover the origins of a museum exhibit which looks like a mummified mermaid. They have already found the mysterious Buxton Mermaid's hair is human. The University of Lincoln team is now testing the DNA of the mermaid's tail to see what fish it came from. 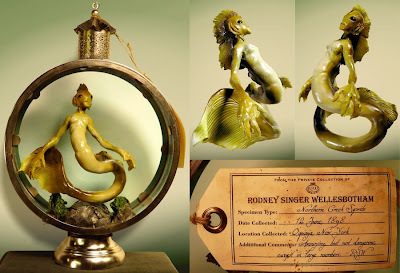 Anita Hollinshead, a conservation and restoration masters student, came across the mermaid while working at the Buxton Museum and Art Gallery. "We think that it came from the mid-19th Century," she said. "We are still doings tests to find that out." It will be interesting to see if this "mermaid" was exported from Japan. Mummified supernatural creatures, or "yokai", were popular attractions at traveling fairs long before regular contact with the west was established. Many ended up being given as temple offerings, and thanks to the protected environment of the shrines some have been able to survive for hundreds of years. It's fascinating how both the east and west developed a tradition of faux creatures and body parts for both entertainment and religious reasons. 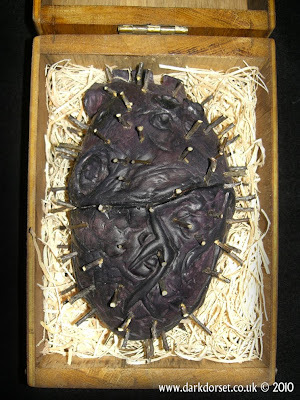 The Dorsetarian brings us this recreation of some traditional protective hedge magic- a Bullock's Heart. It's a visually interesting prop and a creepy little piece of history. At Wyke Regis, Weymouth, there once lived an old woman who was suspected of practising witchcraft, for it was believed she had overlooked a young girl. A gypsy informed the girl's mother to hang a bullock's heart stuffed with pins inside the chimney, which in time would break the spell. 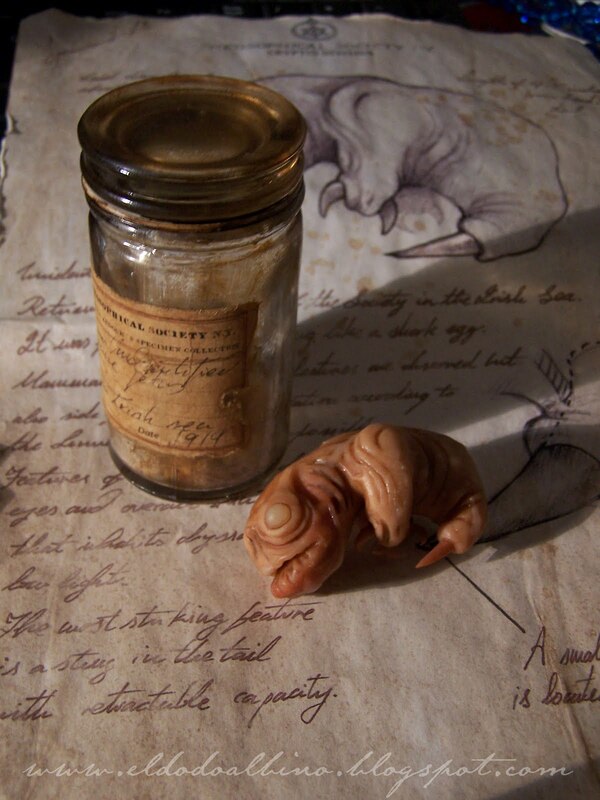 The mother did this and when the heart dried out, it fell into the fire and was burnt to a cinder. Later when her daughter recovered, the old witch was seen in a fit of rage claiming that some one had been meddling in her affairs. Mentioned in the 'Dorset Year Book 1942-3'. The Police station at Frampton, near Dorchester found a Bullock’s heart in their chimney. Can you imagine the reaction when a heart filled with pins came tumbling out? It's a benign bit of folklore, but its appearance lends itself to misinterpretation as something far more ominous. Artists Kim Graham and Douglas Herring bring us this gigantic dragon skull. Despite the immense size of the piece it has an amazing amount of fine detail. Seabat Studios brings us this fossilized Mer recovered from the Antarctic. 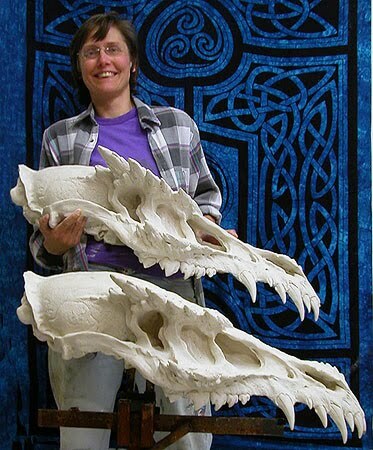 Transporting it back to the United States must have required a herculean effort, given that the specimen is the size of a man. 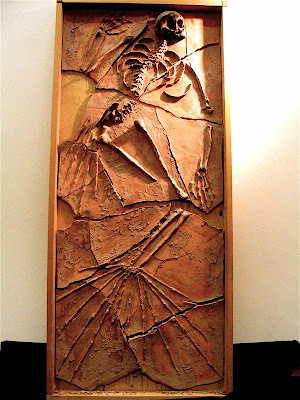 It's amazing that "mainstream" science can continue to deny the existence of creatures like fairies, dragons, and merpeople given the extensive fossil record. Daniel Heald brings us this this fantastically aged page from an Arabic tome. The mix of textures and tone values gives it a great deal of character. 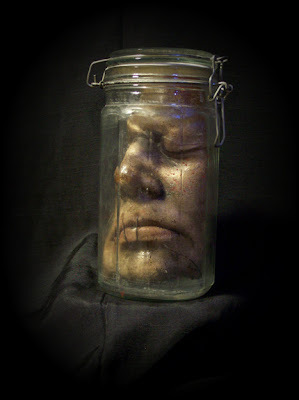 Allen Hopps of Stiltbeast Studios brings us this video tutorial on creating a shrunken head. The finished prop in the video is a little rougher than I would like, but taking some extra time on the structure of the face would significantly improve the final product. Wesley Remory's effort to create an entire tome from scratch continues. 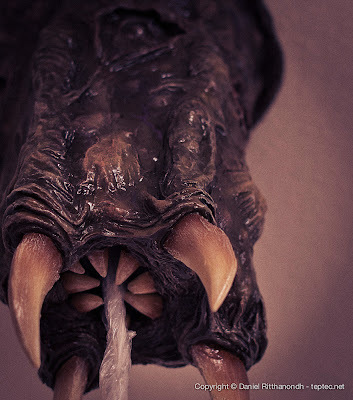 His latest pages flesh out the material dealing with the Deep Ones. 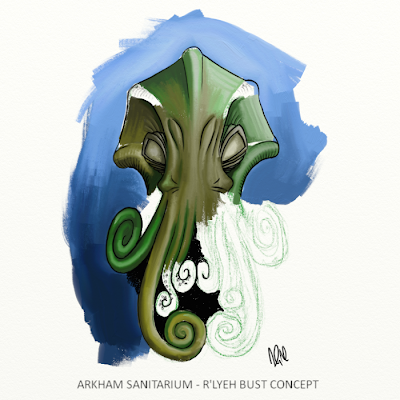 Browse through his gallery for a look at the growing number of illustrations for the project. 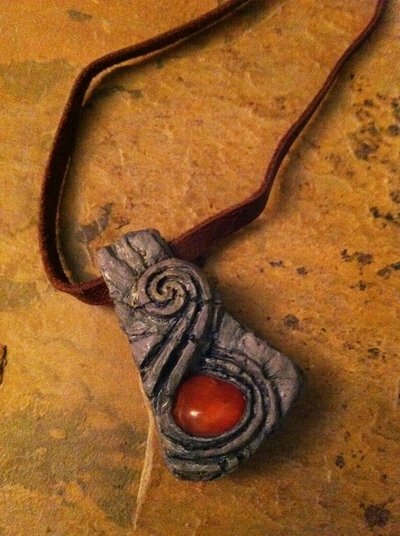 From Krista A. Leemhuis, a stone and carnelian amulet designed to foster clarity and creativity. It reminds me of the spiral-themed designs Brian Froud created for "The Dark Crystal". 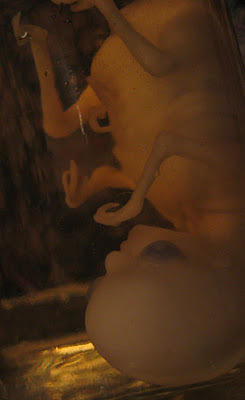 Carim Nahaboo brings us this nicely done fetal specimen. The translucence of the piece really brings it to life. Tóbal brings us this very well done unidentified marine fetus. The specimen itself is outstanding, but the accessories really take it to the next level. The incredibly talented Shain Erin brings us this inhuman figure. It's a wonderful piece that manages to be beautiful at the same time it oozes a sense of deep corruption. Inspired by the "Starcraft" video game series, Kaleb Lechowski brings us this Hydralisk trophy head. 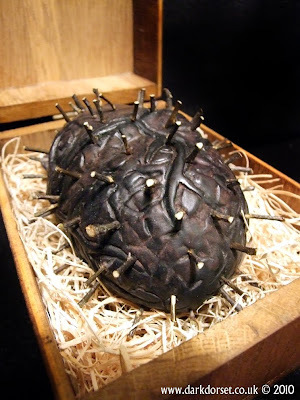 He actually produced two versions of it, one in paper mache (!) as a prototype and a second cast in fiberglass from a silicone mold. As you can see, the finished prop is absolutely immense. The talented Allan Harwood brings us this excellent H.P. 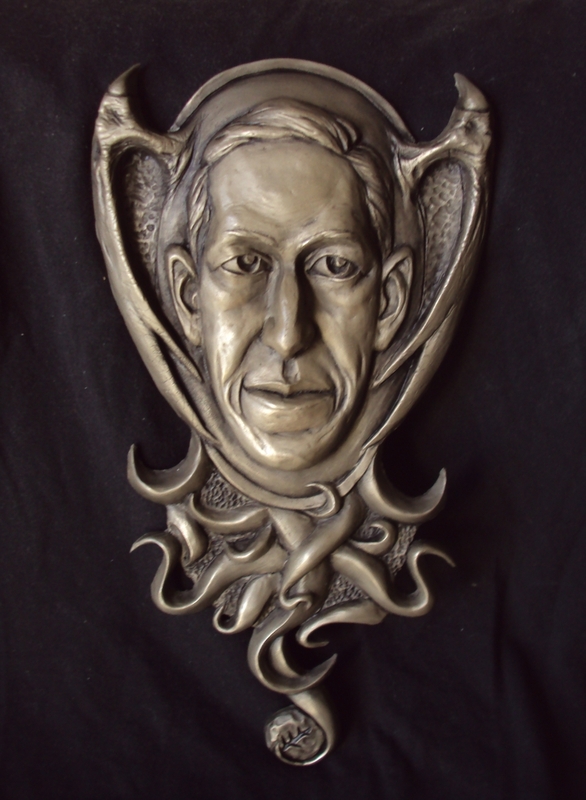 Lovecraft relief. 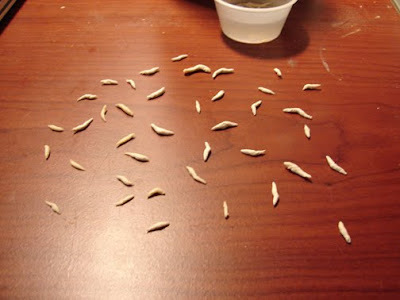 You can see the progress of the project by browsing the previous entries on his blog, which also include some helpful hints on technique. Oh, how I love a tableau of props. Director Andrew G. Morgan brings us this selection of items from his indy film "Arkham Sanitarium". Browse around the rest of the site and you'll find some interesting stuff. 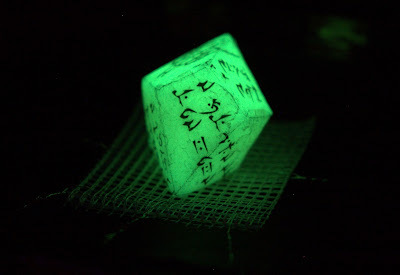 A recent blog entry mentions the possibility of a limited edition Cthulhu idol based on the one in the film, something I'm sure you'll find of interest. Update: The roughs for the idol are over here, while the plan to offer physical copies is mentioned here. 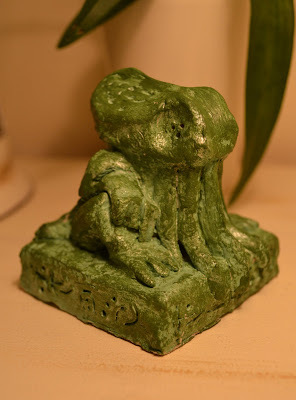 "Alex9994" brings us this primitive small Cthulhu idol. It may seem like a trivial feature, but I really like the way he's stylized the multiple eyes. 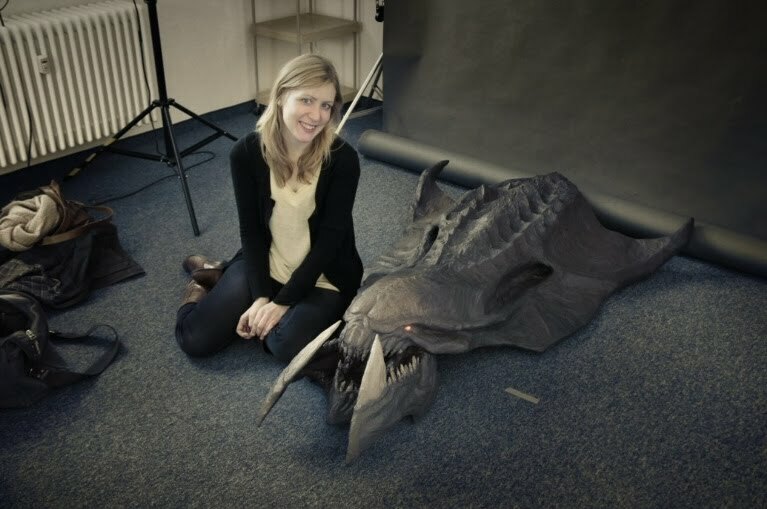 Things are moving along with the Mountains of Madness project. 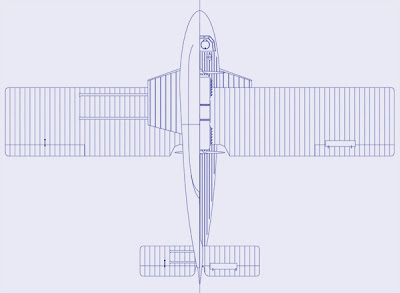 First up, the start of the technical drawing for the expedition's modified Wals. This is just a quick export I did from the Illustrator file, so the line weight is a bit dodgy. 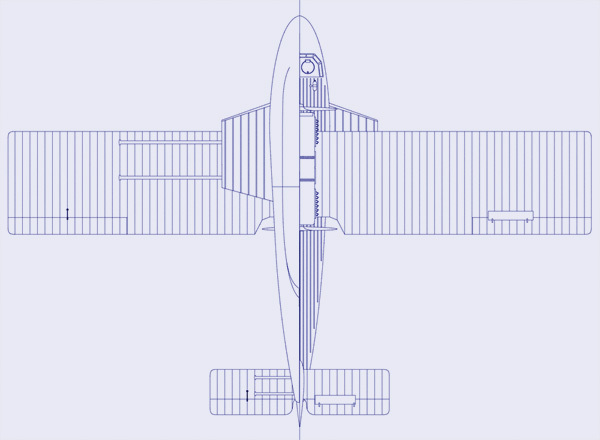 The finished version will be a three-point view of the plane properly rendered with white lining on a blue background. The primary reference for this is Dr. M. Michiel van der Mey's excellent book "Dornier Wal: A Light Coming Over the Sea". I'll try and do a proper review of the book in the near future, but it's the definitive resource for everything about the Do-J. 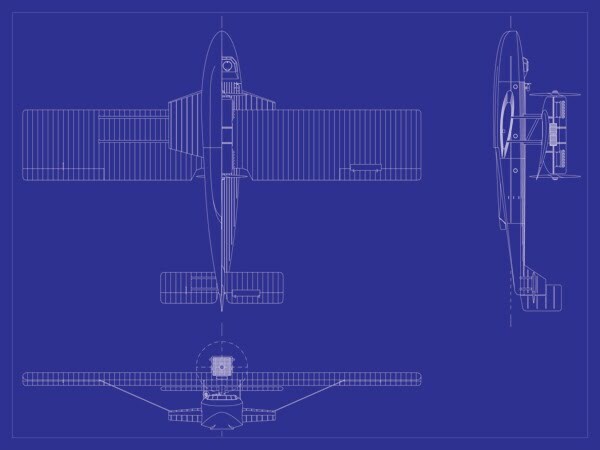 It includes an exhaustive amount of detail on the plane's history and variants, including a a full registry of the aircraft produced. 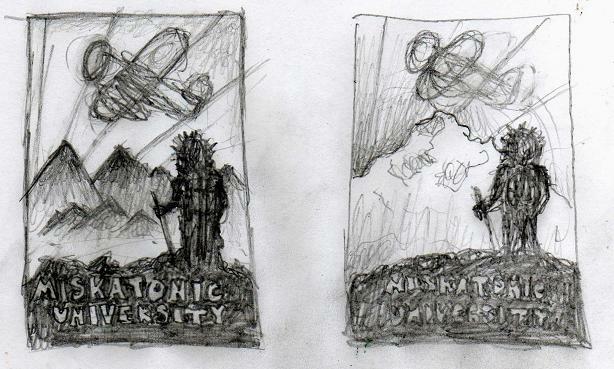 There's enough information there to eventually figure out the serial numbers for the Miskatonic planes. Here's the start of something I'm really excited about. Jason McKittrick is doing the artwork for a conjectural poster for the expedition's departure from Boston harbor. The rough titles in the thumbnails below will be replaced with the specifics for the departure ceremony on September 2nd, 1930.